Here is the question “How to clear the dot marks that spots when hitting the space bar while typing in Microsoft Word” by user of Ofthepc.com. How to remove space bar marking dots in Microsoft Word? ie when typing in Microsoft Word instead of space between the words star mark spots there filling the gap of the space. your Pc might have used by some one else especially check out whether kids around you who is mischievous :) because kids after playing games in the Pc goes to do any changes in the setting or options. 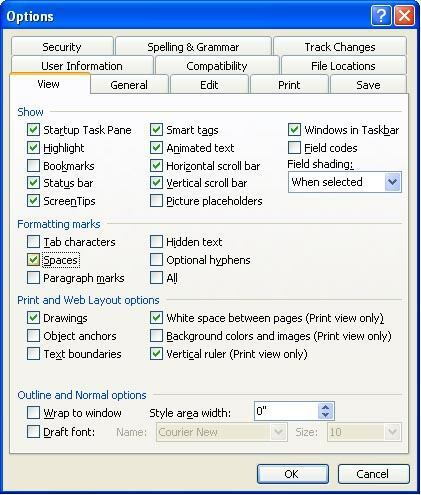 Go to Menu > Tools > Options > In the option Window below Formatting Marks release off the Tick in the box of Space.